India and South Korea sign MoU on sports cooperation! Home / International Football / Asia / India and South Korea sign MoU on sports cooperation! A Memorandum of Understanding (MoU) was signed between the Ministry of Youth Affairs and Sports of India and the Ministry of Culture, Sports and Tourism of the Republic of Korea (South Korea) on sports cooperation in New Delhi today. 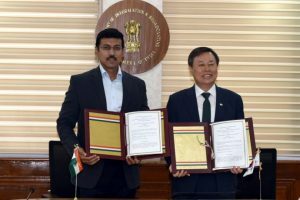 From Indian side the MoU was signed by the Minister of State(I/C) Youth Affairs and Sports Col. Rajyavardhan Rathore and the Korean side was represented by their Minister of Culture, Sports and Tourism Do Jong-Hwan. Expressing happiness over the signing of the MoU, Col. Rajyavardhan Rathore said that such initiative would broaden the cooperation between the two countries not only in the fieldof sports but also in other areas. He further stated that two countries must also collaborate in sports such as Archery and Taekwondo where Republic of Korea is one of the pioneer countries. The best practices in management of sports infrastructure, governance of sports followed by the Republic of Koreas need to be studied for improvement in our system, he added. Speaking on the occasion, Minister of Culture, Sports and Tourism H.E. Do Jong-Hwan said that his country always looks forward to working with India in Sports. Relationship with India is priority for their leadership and they would be happy to provide assistance to India in areas of common interest. The Korean side invited Hon’ble Minister to visit their country. Col. Rajyavardhan Rathore presented an audio collection of Ram Charit Manas and Quotes of Mahatama Gandhi to the Korean Minister. Previous Bundesliga giants Bayern Munich launches online shop in Spanish! Next Indian Arrows head coach Floyd Pinto delighted at getting first I-League win!